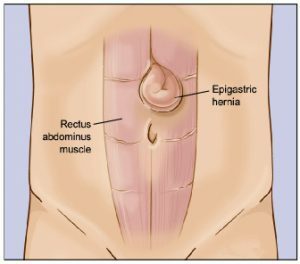 Epigastric hernia is a common type of hernia which results due to some weakness or tear in the muscles of the abdomen. The abdominal tissues through the muscle and causes the hernia. Epigastric hernia is usually a birth defect. It occurs in babies when they are born because of some weakness in their abdominal muscles. Epigastric hernia may get better without any treatment as a baby grows up. His/her muscles begin to strengthen and therefore, the hernia gets treated in its own. The Epigastric hernia is also very much similar in terms of development to umbilical hernia. Usually the Epigastric hernia is small tears of bulges in the muscles of the wall of the abdomen. However, in more severe cases, a Epigastric hernia can result in organs pushing through the muscular walls. This is an extreme case and need instant medical attention. Epigastric hernia mostly occurs in babies at the time of their birth. The Epigastric hernia is usually diagnosed by a doctor easily as it is quite visible. Apart from this, there are no obvious signs of Epigastric hernia. A patient may cry a lot, have problems in bowel movement, abdominal pressure etc. 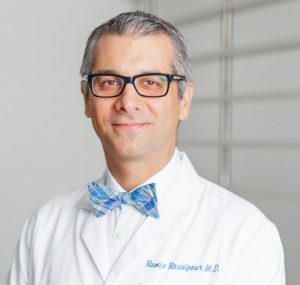 How is Epigastric hernia treated? Epigastric hernia requires medical attention and proper examination. It can get better on its own as a child grows up and his/her muscles become more strong. However, this medical condition cannot go away on its own. It requires proper treatment and medical attention. 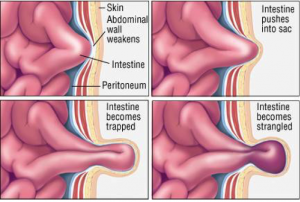 In some extreme cases, the Epigastric hernia needs to be treated through a surgery. However, this is usually not too urgent and can be postponed till a child grows up. Epigastric hernia can become a fatal medical condition too – if not given proper medical attention. This is why doctors and nurses are urged to properly examine the new born children and check for any symptoms and signs of Epigastric hernia. It is very important for the family and the doctors to be vigilant enough to detect any symptoms of Epigastric hernia because new borns are unable to explain what is wrong with them. 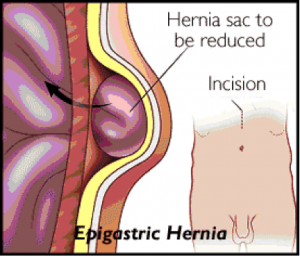 How is the surgery performed to treat Epigastric hernia? Epigastric hernia is usually and preferably performed after a child grows up, unless of course the hernia possesses a danger to the life of the baby. The surgery for Epigastric hernia is performed by the Laparoscopic repair method. Small incisions are made in the abdominal region – which is affected. A small laparoscope like machine is then placed inside the body of the patient through these incisions to see the tears and bulges created in the abdomen of the person. With the help of the small laparoscope a physician is able to fix the damaged and torn muscles of the abdomen. The defects in the abdominal muscles are fixed by using mesh or other synthetic materials. Sutures are also used to fix these tears and bulges and prevent them from happening again in the future. Epigastric hernia is not a very dangerous disease and can be prevented as well as treated.